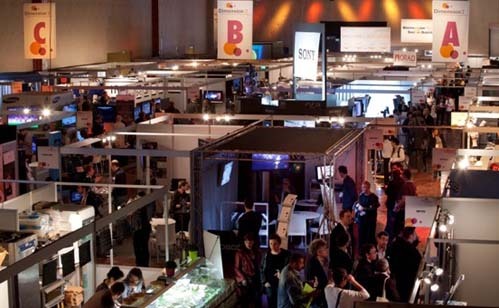 The Dimension 3 event was held on May 24 – 26 in Paris, France. Aimed at those interested in stereoscopic 3D creation, filming, post-production and broadcasting, the event comprises a conference, exhibition and film festival with awards. This was the fifth year of the show, and the organisers put the number of visitors at 3,780 in total from 37 countries, and had an impressive 130 international speakers at the conference. There were also 103 entries to the festival from home-grown French talent and 16 other countries, including some world-famous producers. With over 70 exhibitors at Dimension 3, there was plenty to see in terms of technology, and a wide range of applications were covered. As expected, among the exhibitors were a number of companies showing their own rig designs. 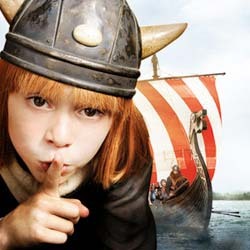 Stereotec for example, was showing rushes of the new sequel to Vicky the Viking (Wickie und die starken Männer), which, according to the company, was shot with minimal errors thanks to the accuracy and stability of its 3D mirror rig. 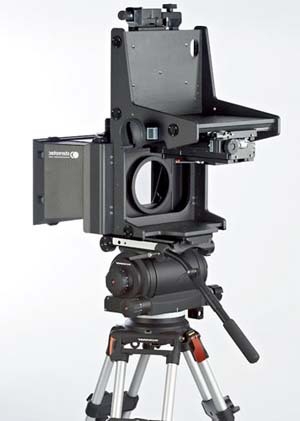 According to Stereotec, this is the first rig on the market that can be mounted upside down or straight. Vicky and The Treasure of The Gods (Wickie auf grosser Fahrt) is being hailed as Germany's first live action 3D film production. Stereotec also offers a side-by-side live rig which is fully motorisable for up to ten 3D parameters, and a stereoscopic calculator software package for Windows and Mac that will calculate the required interocular and convergence settings for given parameters such as set distances or type of lens. The Stereotec side-by-side 3D rig. A rig of a different kind was on offer by Le Taillefer Production. The Smartflyer is a remote-controlled helicopter-like flying machine that can carry a small 3D camera such as the JVC GS-TD1. Its video is sent wirelessly to a monitor (2D currently) on the ground. 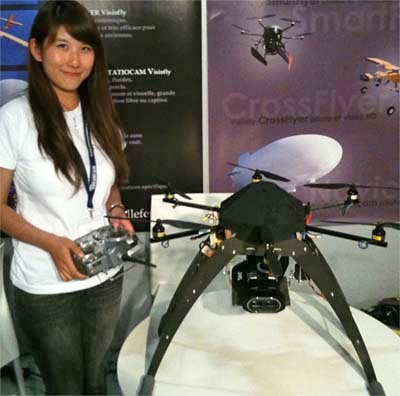 The 6-propeller version can carry a 1kg camera, while a 1.5kg camera will require an 8-propeller version. Customers are given an off-the-shelf helicopter to practice with, and are then given a day’s training at the factory. The Smartfly remote-controlled helicopter rig for lightweight 3D cameras. Service company Sublab was demonstrating the Live Player 3D using two Phantom cameras. This software allows near-real-time playback of high-speed 3D and slow motion. Meanwhile Stereolabs showed its auto-alignment software being used with Microfilm’s 3D rig. The software analyses the image being shot and automatically sends control data back to the rig to correct the lens positions in case of misalignment. The Stereolabs auto-alignment software in action. Some clever things are being done with directional sound. At the ISE show in Amsterdam earlier this year, as I walked along an aisle, I was followed by the sound of someone beckoning to me in a whisper, just behind my right shoulder. It followed me for a good few meters. No one was there. At Dimension 3, an EU-funded consortium called 2020 3D Media was demonstrating what it called 3D audio. Now in year three of a four-year term, the project involves storing the source position of sound sources, and then reconstituting these positions by calibrating any speaker setup. The system is scalable from small home setups to much larger systems. I must admit that the demo sounded just like surround sound to me, but to be fair, I would have liked to have listened longer in order to appreciate what I was hearing, and perhaps to different examples of content. Digital signage is a prime candidate for glasses-free 3D displays, and among the companies showing autostereoscopic 3D (AS3D) applications was Dimenco. 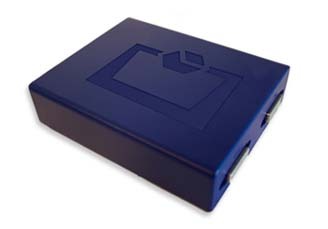 Its rendering box takes a 2D picture plus a depth map and renders this to any 3D format. At the show, the system was creating 28 views for an autostereoscopic display, each with a viewing angle of 15-20 degrees. Dimenco’s Erik van der Tol pointed out that unless a Blu-ray 3D film made for theatrical release is re-edited for a shorter viewing distance, most of the depth is lost, so the Dimenco product allows for depth, offset and some other parameters to be adjusted. It also supports 2D to 3D conversion. The Dimenco rendering engine take 2D+Z data and renders it to any 3D format. V3S had an interesting application for training purposes. The system creates a 3D person, and using the Kinekt platform for body/movement tracking, allows a subcontractor for example, to move around a 3D simulated environment and learn routines or processes. The system could be particularly useful for familiarising people with potentially hazardous or challenging situations. The V3S system in action. Just stand in front of the screen, put on your glasses and move around a simulated environment in 3D. 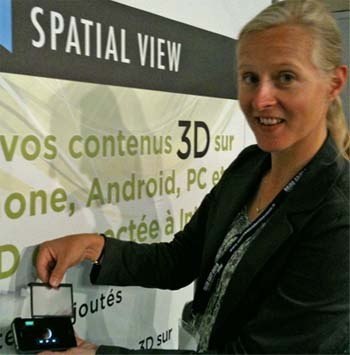 Spatial View has a mission to bring 3D to the greatest number of people possible, whether it be through PCs, laptops, or mobile devices. The company has set up 3DeeCentral as a library of 3D content, and this currently has around 200 titles. Each title is reformatted to be compatible with all platforms, with suitable depth adjustments, and is quality checked. Spatial View has also created the 3Deeslide for iPhone. This case with removable lenticular lens turns the iPhone display into an AS3D display. There is also the 3Deeflector screen which does the same for a PC. The Spatial View 3Deeslide comprises a case for the iPhone and a lenticular lens that slides in front of the display to make it AS3D. 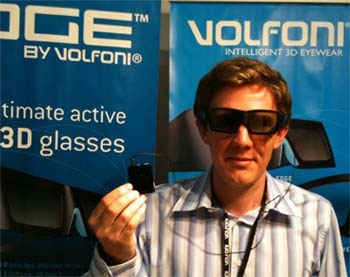 Volfoni was showing a prototype of its ActivEyes universal 3D glasses that can act as passive or active. For active use, the glasses plug into a small ActivMe unit. The code for the TV is downloaded to this, and it connects via IR to the ActivHub (or transmitter), which in turn connects to the TV via USB. Prototype of the Volfoni ActivEyes universal 3D glasses connected to the ActivMe unit. The demonstration that made the biggest impression on me was by 3D4COM. This was in a dedicated theatre with a projector, screen and stage built on the company’s stand. The applications being demonstrated included business presentations with a 3D set into which the presenter could virtually step, 3D pie charts moving into the audience, and a tour of a hotel, with specifications appearing when required. For educations applications, we were shown the workings of the nervous system, a virtual helicopter was flown around the stage and into the audience, and an animated character called 3D Boy appeared on stage and had a live conversation with our presenter. He was being controlled by someone from behind the scenes and was following his voice and eye movements. 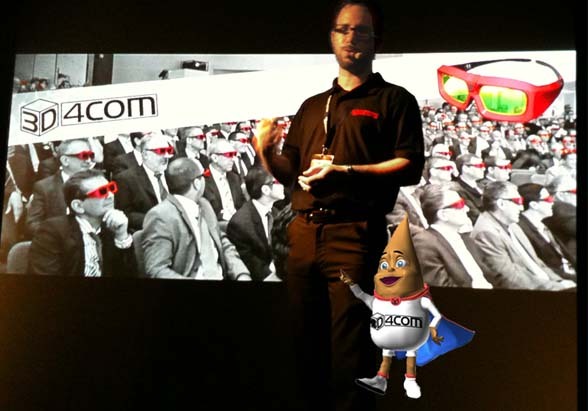 The live presentation by 3D4COM, featuring 3D Boy. Words obviously don’t do this demonstration justice, but it really showed how compelling and inspiring 3D can be. Compared with your standard PowerPoint, a presentation in 3D is something else! This was our first visit to Dimension 3, and we were very impressed. The location was a little awkward to get to, but once there, the converted warehouses in which the event was held were perfect venues for a show such as this. There was a large theatre for screenings, conferences and awards, and the show floor worked well. 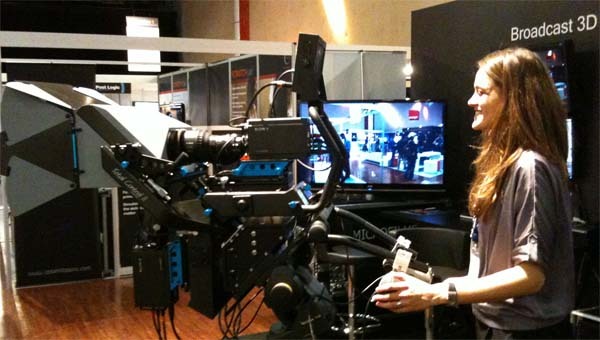 Compared with other general broadcast and production trade shows such as IBC and NAB, it is small, but the quality of the exhibits and most of all, the enthusiasm of everyone participating, showed that this is an event with a bright future, and certainly one worth visiting for the interesting and varied range of applications covered.